The UK’s domestic racing calendar kicked off on Sunday at the Perfs Pedal Road Race, so we’re continuing our look at the top teams you should be looking out for in 2019. This is the second of a four-part series giving you a rundown of the UK’s top men’s teams this year. 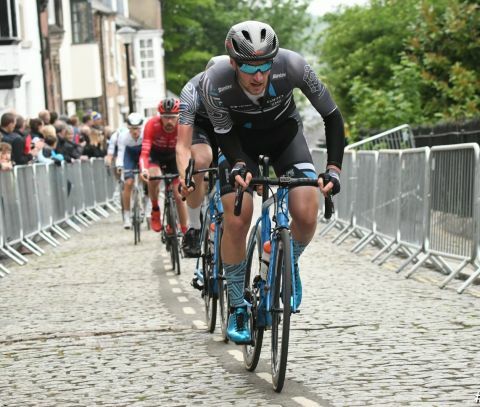 New on the block as a professional team but having been around a few years as an elite squad, Ribble Pro Cycling have been dominating the British Cycling rankings as of late. The squad’s list of key results in 2016, 2017, and 2018 makes impressive reading, coming as it does with multiple National and Regional Championship titles, and this is padded out with countless victories in smaller regional races and strong showings in foreign UCI .2 ranked events. These results may carry less traditional weighting, but there is value for the team’s sponsors – supporting a winning team is a great way to advertise an organisation. Nevertheless, there are definitely riders to watch: Dan Bigham and John Archibald have been making waves on the track over winter, winning World Cup events as part of the HUUB Wattbike team. Bigham has proven he’s no slouch over the longer events either, having taken 3rd at the 2016 Beaumont Trophy. Mark Stewart has raced for An Post-Chain Reaction and tasted success on the track as well, while Jacob Tipper returns from a season of racing abroad and competing with the HUUB Wattbike team. Aside from the line-up, expect the kit to impress - Bigham studied Motorsport Engineering at university and achieved a Master’s degree to match. He has since worked with F1 racing teams, sports technology companies, and even set up his own company focused on aerodynamics and performance cycling products. This technical expertise will undoubtedly be brought to bear on the team and with riders searching for technical advantages more than ever, he’s the one to know. A name change for a team stepping up from the elite ranks to become a professional squad in 2019. SwiftCarbon Pro Cycling is the evolution of Team KTM, a squad that performed strongly in UCI races and National Series rounds alike. Manager Paul Lamb says that progressing to UCI Continental status was always the plan but, credit where credit is due, following through on this is often easier said than done, especially when it comes with added financial and logistical challenges. The team has taken on a few more riders to swell the ranks and, excluding strong man Will Bjergfelt, has one of the youngest teams around with an average rider age of just over 23 years old. These riders aren’t the well-known hitters that you’ll find on the larger teams, instead they’re riders who shape races with the audacity of youth and a desire to prove themselves. Write them off at your peril. George Wood finally makes the leap from Richardsons-Trek RT to a UCI squad and, if he’s been knocking on the door for a while now, he’s been held back by circumstance and injury. He can cause a mighty upset if left to his own devices – he was third to Ed Clancy and Tom Pidcock at the 2018 London Nocturne and came close at the Tour Series in Stevenage. The team also brings Ed Laverack and Tristan Robbins back to the fore - U23 and Junior National Champions respectively – who will no doubt look to deliver on the promise of their youth. SwiftCarbon may not be the first name on the pundits’ lips this year, but they’re poised to shake things up and the riders will likely grab any chance with both hands.